When Monash Arts staff and students came back from the summer holidays, we learned that management would be imposing significant cuts to our faculty, cuts which have resulted in larger class sizes, more online ‘learning’, and less interaction and exchange between staff and students. Specifically, the cuts are to sessional staff budgets. How these changes will impact staff and students within the faculty depends on which school they’re in – the social sciences, and philosophy, history and international studies are the schools hardest hit – but one measure being implemented in many schools is that sessionals who hold a PhD, like the staff member quoted above, will no longer be hired. Other ‘cost-saving’ measures include an increase in tutorial size, from 25 to 30 (Lazarus described how one of his students had to sit on the floor during his tutorial due to insufficient space); a reduction in contact hours, from three per unit to two; a reduction in the number of weeks tutorials run; the substitution of smaller essays with online components, such as quizzes; and the prohibition of tutors providing feedback to students outside set tutorial times (or if tutors do offer additional feedback and time, they will no longer be paid for that work). Arts staff first found out about the cuts ‘through whispers’ at the beginning of the semester, and management have remained tight-lipped since about the precise nature of the cuts, even to the point of denying the cuts are taking place at all. The National Tertiary Education Union (NTEU) says Dean of Arts Sharon Pickering has refused not only to send out a faculty-wide email detailing the cuts or justifying them, but that she also said that there are no cuts; that she had simply instructed the heads of schools not to exceed their sessional staff budgets. 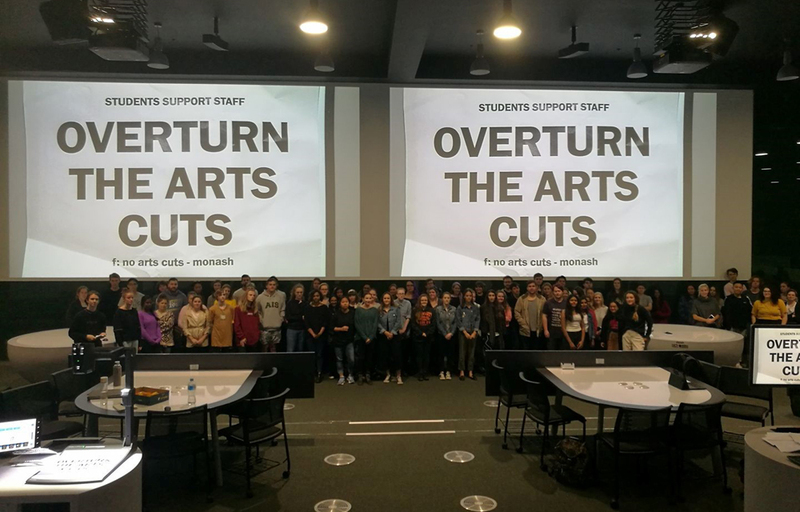 Last week, the National Union of Students launched it’s ‘No Arts Cuts’ campaign and the first step was to survey staff and students about the stubborn silence from university management, and what the uncertainty meant for the future of Monash Arts. When poring over the survey responses, a pattern emerges confirming what the NTEU has also outlined: overcrowding of classes, less face-to-face time with teaching staff, and the introduction of the ‘lectorial’ – a benign-sounding portmanteau disguising a money-saving method, whereby the university crams as many students as possible into a room at the one time. There are reports that some classes now have up to 70 students. [The lecturer wears] a microphone the entire time and if students want to speak ‘for their table’ – these large classes have to be organised into allocated working groups – a roaming microphone is given to them and they are filmed with a hand held camera! … It’s awful and inorganic and both makes one-on-one teacher–student engagement impossible and discourages natural, organic contributions in class discussion. While staff are rightly frustrated by the dean’s cost-cutting, so are students. Obviously student learning conditions suffer when staff lose their jobs and face-to-face time is reduced. An increasingly common experience is the ‘phantom lecture’. This is when surplus students can’t fit into the main lecture theatre and are told to go to a second theatre where they’ll find the main lecture streamed onto a screen. Except, that is, in the first week of this semester, when the university forgot to hire someone to set up the stream in the second lecture theatres and students were left staring at a blank screen. It’s a perfectly fitting scenario where staff cuts, overcrowding of classes and the push towards [cheaper] online learning all come together into a ridiculous comedy of sheer incompetence. Meanwhile, Caulfield campus students have reported that their lectures for some units have been cancelled altogether, and that they’ve been advised to watch the Clayton lectures online instead. But students are channelling their frustration at university management into action. ‘Even if students don’t know the details, they know what the cuts mean for them,’ says Tess Dimos, the NUS Monash Clayton Campus Representative. ‘And [this isn’t just happening to] arts students: students in science, health and other faculties have reported similar cutbacks to their courses.’ Dimos says students have been taking photos in their classes that evidence the effects of the cuts, leafleting in front of the arts library, collecting signatures for a Monash-wide petition and have called a mass student meeting to take place next Tuesday 20 March to discuss the campaign, and to demand a reversal of these cuts. As is the trend across contemporary universities, when it comes to teaching and learning conditions, Monash cries budget restraint. Yet when it comes to improving the university’s ‘standing’ or corporate brand, Monash’s coffers suddenly run deep. Here’s but one example: Monash is currently undertaking a $45 million program to improve its performing arts precinct. Ironic, given that Monash scrapped its dedicated Bachelor of Performing Arts at the end of 2013, meaning that there are now far fewer students to benefit from the new facilities. One can only conclude that university management is more interested in reputation than education. But this is a fight that Monash staff and students are determined to win. Both the NTEU and NUS are calling on management to reverse these cuts immediately. As Nic Kimberly observes, ‘Monash is an extremely wealthy university’: it can afford to provide high-quality education. With the growing awareness among Monash students about these cuts to various faculties, there’s every possibility that a militant, defiant campaign can deliver staff and students a much-needed victory, and help us grow a movement that can defend the right to quality higher education in this country. For those who can make it, there’s a No Arts Cuts open student meeting 2pm Tuesday 20 March, in front of the Matheson library at Monash Clayton. 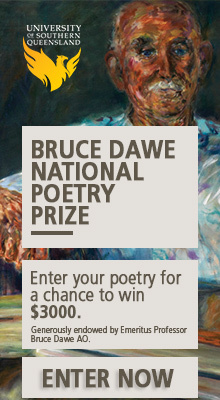 Science students could definitely benefit from taking a leaf out of the Arts students’ book. All 3rd year chemistry units have suddenly gone from having 3 hour long lectures a week to one two hour ‘interactive’ lecture per week. If anything I have noticed the lecturer rushing through the slides more than offering opportunities for students to interact. Am I supposed to be happy with the loss of 12 hours worth of lecture content for each chem unit I am paying no less money for? I could forgive this if they gave us a tutorial instead but we don’t have these in third year. I hope this campaign is able to achieve some thing for the arts faculty and all other affected faculties!